In North Texas, private institutions Texas Christian University and Southern Methodist University left their athletes with big bills. If a coveted "full ride" is the goal for your little soccer or football stars at home, then take note: Not all college sports scholarships are the same. Gone are the days when a college sports program's prestige and pathway to a potential pro career were the main factors in selecting where to take one's talents. Rather, in an era when the cost of school attendance can vary by tens-of-thousands-of-dollars, today's amateur athletes also need to consider whether a given college's financial aid will be enough to get them to graduation. A Business Journals analysis of roughly 2,000 colleges found aid packages at many schools, particularly prominent private colleges, often fall well short of each campus' estimated cost of attendance. The numbers also highlighted a material difference in what male athletes receive on average versus their female peers. At Duke University in Durham, North Carolina, the school's 779 student athletes each averaged $24,904 in financial aid in 2017. While that ranked Duke among the 25-most generous schools in the nation when it came to the average dollar value of support for its athletes, the school's average aid package was but a drop in the bucket when compared to its $75,000 estimated cost of attendance. In fact, Duke's athletic aid-to-sticker price ratio of 33 percent was the lowest among major colleges analyzed for this story. Similar scenarios were found at pricey private colleges in cities ranging from Boston to Los Angeles to Evanston, Illinois, where Northwestern University's average aid package of $40,057 per athlete was tops in the nation last year. That equated to about 53 percent of Northwestern's asking price of roughly $75,800. $30,395 in student aid, but that was roughly half of the $60,704 it costs to attend the Fort Worth school. Similarly, Dallas-based SMU awarded its 497 student athletes an average of $38,001, but that was far less than the $74,918 in costs to attend the university. The Business Journals' analysis relied on U.S. Department of Education data tracking student aid and financial support for all student athletes at a given college or university. The results did not break out aid figures for athletes in specific sports. To see the colleges that offer the most in scholarship and financial support for athletes, click here. A common thread among most colleges offering aid to student athletes is how the support breaks down among genders. In short, female student athletes receive less. Among the 100 schools to offer the most aid to student athletes in 2017, 52 percent of the $1.3 billion in total support went to male athletes, averaging around $21,900 per student. 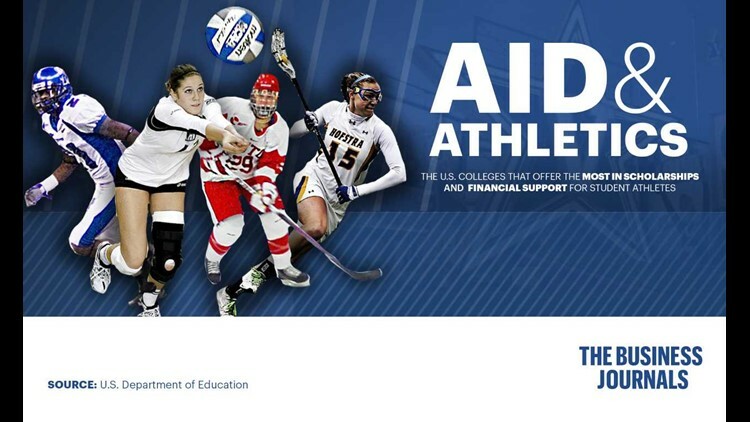 Women athletes received an average of $19,500 per aid package, or 11 percent less. At Northwestern, which declined to comment for this story, male athletes averaged $10,335 more aid than female athletes last year, according to DOE data. Tulane University’s average aid package for male athletes was approximately $20,000 larger than what was offered to female athletes. There were exceptions. The University of Denver offered female athletes $37,624 in financial aid on average last year — about $11,000 more than what male athletes received. Likewise, female athletes at the University of San Francisco averaged $33,839 in aid in 2017, some $9,458 more than their male contemporaries. And at Seton Hall University in New Jersey, female athletes averaged $32,872 in aid on average, or about $11,000 more than what male athletes were given. Another common theme among those three schools: None have a football program, where athlete rosters often run close to 100 players deep and can sway aid numbers in favor of male athletes.